The smile would warm the cockles of your heart. Especially if you were a CIA agent. This was exactly what was wanted. Happy obedient leaders. Democracy simply got in the way. 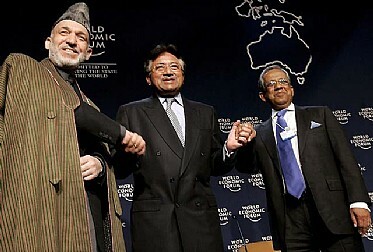 Karzai, Musharraf, Fakhruddin. The new alliance. One new poodle. It was summer 2006. The Talibans were getting ever closer to Kabul. Sitting in the Aina office in Choroi Malek Asghar, I was listening to Reza, founder of the Afghan media organisation. The recent anti-drug campaign was bound to have failed he claimed. Ahmed Wali Karzai, the president’s younger brother was the chief beneficiary of the drug trade. The US $ 500 million or so spent on combating drugs, was more likely to have been spent on the now famous ‘corrupto mansions’ than on alternative livelihood for opium farmers. A month later I was across the border, in the earthquake zone in Muzaffarabad, Azad Kashmir. 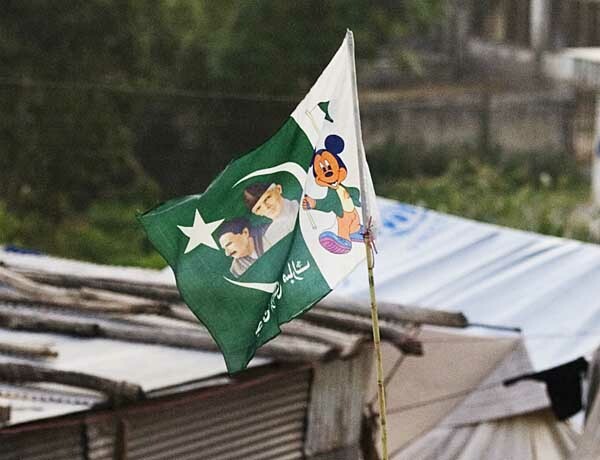 I spotted flags with Iqbal, Jinnah and Mickey Mouse flying above one of the refugee camps. The significance of the cartoon character had escaped me. Chatting with my friend Zaheer back in Karachi, I brought up the subject. “Mushy Mouse” was his smiling reply. Mushy had come into power through a military coup, ousting an elected prime minister. He had suspended the constitution twice and arrested the chief justice of the Supreme Court of Pakistan. On 3rd November 2007, days before a bench of the Supreme Court was to decide on a petition challenging the constitutional validity of his re-election as president, he had shut down all private television channels. He had also failed to protect the life of his chief political opponent, Benazir. The real Mickey might have run the country better. This comedy of errors is a tragedy in the making and our adviser is being true to his script. Mushy would have been proud of Fakhruddin’s human rights record. The ban on media coverage of indigenous rights groups. The more recent ban on the outspoken journalist Nurul Kabir from TV talk shows and the written ban on the popular live programmes on Ekushey TV, neatly slot in with the suppression of free media that both Mushy and Karzai have practiced. Like most other bans, Kabir’s had no paper trails. No written instructions to deny. Just the phone calls from Uttor Para (the cantonment) that we have come to recognise. Our Chief Adviser might even be trying to get ahead of his senior poodles by teaming up with the Myanmar generals. But Mushy Mouse and the mayor of central Kabul have already staged their sham elections. Our adviser’s play is yet to be played out.